It has been my privilege to serve Wisconsin Early Childhood Association for the past 14 years. Our organization works to promote the critical importance of the child care profession and strengthen investments in the teachers who provide vital care and education to children from over 72% of Wisconsin’s families each day. In early July Wisconsin Early Childhood Association released a comprehensive study of early childhood teachers in Wisconsin. (Our last study was in 2010). The findings will make for some very different conversations. Take for example the education level of child care teachers. More than half – 52% – have an Associate degree or higher. This is more than the Wisconsin workforce in general in which 42% hold an Associate degree or higher.2 The education level of child care teachers has a considerable effect on the quality of teaching and on outcomes for our youngest children. 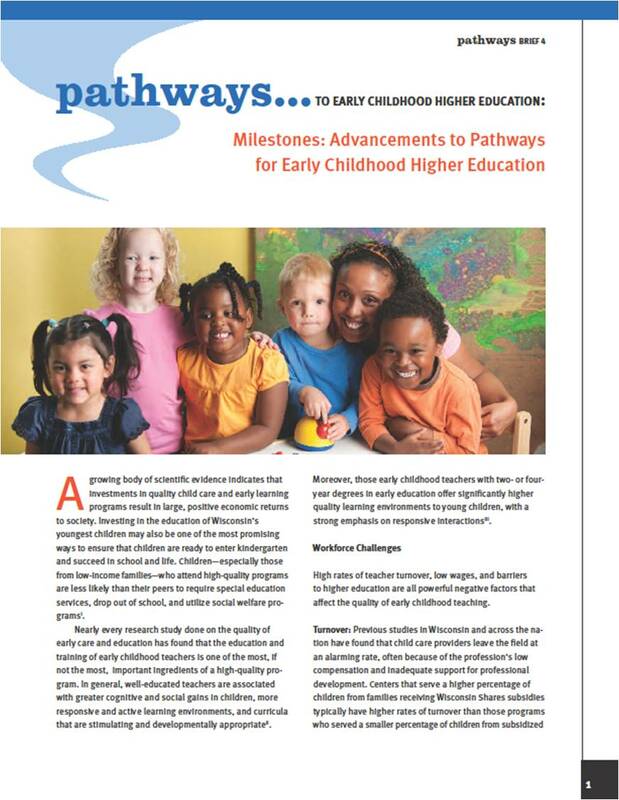 Higher education at even greater levels for the early childhood profession is essential. Yet, there’s an unexplained pay gap. Wisconsinites with an Associate degree who work in fields other than early care and education can expect to earn $18/hour on average. However, degree-holders in early care and education can expect pay which averages $10/hour. Annualized, child care teachers earn $17,000 less than other Wisconsinites with an Associates degree. The gap grows wider when comparing those in the field who hold a Bachelor’s degree – $12/hour – versus those who hold that degree and work in another field – $22.80/hour. Annually, the child care teacher with the Bachelor’s degree earns fully $22,500 LESS. Ruth Schmidt is Executive Director of Wisconsin Early Childhood Association and a registered lobbyist. Last week came the announcement of the “Let’s Move! Child Care” initiative, launched by First Lady Michelle Obama. Click here for more information about the initiative, ideas and resources for early educators, healthy eating tips, and physical activities for infants and toddlers! Screen Time: No screen time for children under two years. For children age two and older, strive to limit screen time to no more than 30 minutes per week during child care, and no more than 1-2 hours total of quality screen time per day, the amount recommended by the American Academy of Pediatrics. Beverages: Provide access to water during meals and throughout the day, and do not serve sugary drinks. For children age two and older, serve low-fat (1%) or non-fat milk, and no more than one 4-6 ounce serving of 100% juice per day.